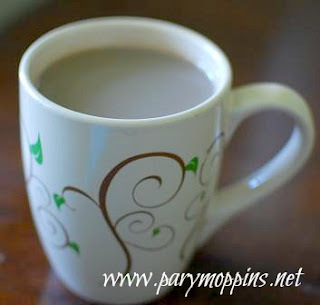 Pary Moppins: Perfectly Practical #171 - How Do You Take Your Coffee? Perfectly Practical #171 - How Do You Take Your Coffee? The sugar post, the milk post, and now this week's "How do you take your coffee post" were all spurred on by a lovely group of bloggesses of which I am associated. Almost all of my Pin It Tuesday co-hosts have been expats at some point in their lives - many of them in England. We had a discussion about how the British make it so easy to know how they take their tea and coffee. I would love for this system to catch on here so that people don't look at me crazy when I answer the question of how do you like your coffee/tea with, "White." When in a room of people and you are offering hot drinks you ask, "Who would like coffee" and "how do you take it?" Your guests would respond with an appropriate response such as, "I'd like mine black with 2" or "I'd like one milky with 1 please" and by that, you would know how to fix everyone's coffees/teas efficiently. Now I realize that this isn't a perfect system. For us in the south, we actually like cream in our coffee but it still can be absorbed into the system. Maybe we add a few options like "ecru" instead of "white" and "platinum" instead of silver when using cream. Or we just treat milk and cream interchangeably like we do for cokes. Every carbonated beverage in the South is a coke so all dairy products going into coffee would be milk. Let's be trendsetters and bring a little bit of England Stateside. Who's with me?